Burl Icle Ivanhoe Ives (June 14, 1909 – April 14, 1995) was an American actor, writer and folk music singer. 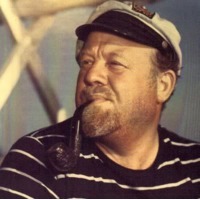 As an actor, Ives's work included comedies, dramas, and voice work in theater, television, and motion pictures. Referring to Ives's singing, music critic John Rockwell said, "Ives's voice ... had the sheen and finesse of opera without its latter-day Puccinian vulgarities and without the pretensions of operatic ritual. It was genteel in expressive impact without being genteel in social conformity. And it moved people."